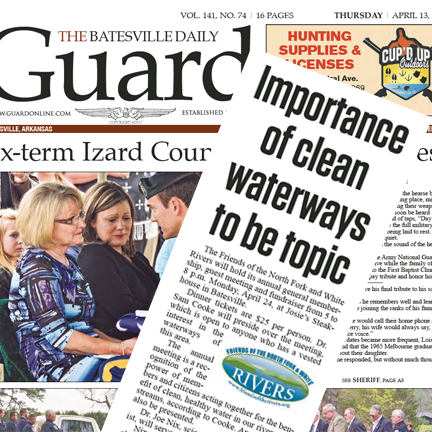 Thank you to friends of the rivers at the Batesville Guard! for sharing an invitation for all to attend the Annual General Member, and guest meeting on Monday, April 24th at Josie's Steakhouse on the White. The importance of clean waterways is the topic and the guest speaker is Dr. Joe Nix. Dinner tickets are $25 per person, and Dr. Sam Cooke will preside. Attendees are invited to purchase chances to win two great guide trips. Click here for more information and to register. The article was split over two pages and a little awkard to read. Here it is in it's entirety. The Friends of the North Fork and White Rivers will hold its annual general membership, guest meeting and fundraiser from 5 to 8 p.m. Monday, April 24, at Josie’s Steakhouse in Batesville. Dinner tickets are $25 per person. Dr. Sam Cooke will preside over the meeting, which is open to anyone who has a vested interest in the waterways of this area. The annual meeting is a recognition of the power of members and citizens acting together for the benefi t of clean, healthy water in our rivers and streams, according to Cooke. An award will also be presented. Dr. Joe Nix, scientist and environmentalist, will serve as guest speaker. Nix received his Ph.D. in nuclear geochemistry in 1966 and immediately adapted his research skills to studying streams in Arkansas. The Arkansas environmental movement was building strength, focusing on preventing the damming of the Buffalo River. The Ozark Society was formed for that purpose. Nix — like Neil Compton, Harold Alexander, and other environmentalists of that era — was heavily infl uenced by the writings of Henry David Thoreau and Aldo Leopold, according to a news release. Attendees will have a chance to purchase chances to to win guide trips to areas like the Little Red River, White River or Crooked Creek. Guide Gabe Levin will take one to two people fly fishing for a half day (four hours), on the White River, North Fork or Crooked Creek. This trip is valued at $300. He will provide equipment and other accompaniments. “Gabe strives not only to help his clients become better fishermen, but also to find opportunities to nurture an appreciation for the richness of our local aquatic resources,” the news release states. Lowell Myers will offer one winner a guided trip on the Little Red. He is a seasoned fly fisherman of 30-plus years, casting instructor, fly fishing competitor and fly-tyer. After guiding part time for several years, Lowell joined Jeff Smith (friend and creator of the Trout Magnet) and became manager and operator of the Sore Lip’Em All Guide Service. A former business administrator, Lowell now resides in his cabin on the Little Red River living his dream as a full-time fishing guide, according to a news release. For more information, email riverfriend@friendsoftherivers.org or visit www.friendsoftherivers.org.